The improbable became reality on Friday night as the Chico State Wildcat women's basketball not only beat a very good Monterey Bay team on their home floor on senior night, but they also won their first out-right CCAA Basketball crown for the first time since 2007-2008. Hannah Womack would provide the capper for the Wildcats with a left baseline three...giving Chico State a 77-70 lead with two minutes to play. The Wildcat women would win the game 84-75 and win the CCAA regular season title. Now, the second season begins. 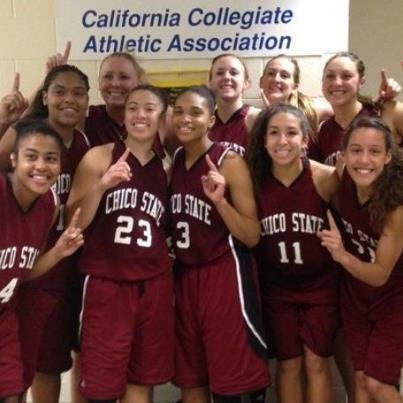 March Madness feels like it has already started, but the big prize for the Chico State women still awaits. After this week's CCAA Conference Tournament, the Wildcats will get ready for the NCAA Tournament in two weeks. The Chico State women are in a position to host the eight team NCAA Championship West Region Tournament, but they will need a deep run into the CCAA Tournament to garner consideration. The latest polls have the Wildcat women ranked 3rd in the West Region with Western Washington and Simon Fraser in front of them in the rankings. Chico State opens play in the CCAA Tournament this week with a first round game at Acker Gym on Tuesday. The Cats will host San Francisco State at 5:30pm. Chico won both match-ups with the Gators this year but those games were not easy. The Gators pose problems with their suffocating defense and ability to stop transition points. If Chico State wins they will advance to the CCAA Tournament semi-finals in Ontario on Friday afternoon where they will either play at 12 noon or at 2:30pm......March Madness is here !!! !